December 18, 876 (Jōgan 18, on the 29th day of the 11th month): In the 18th year of Emperor Seiwa's reign (清和天皇18年), he ceded the Chrysanthemum Throne to his son, which meant that the young child received the succession (‘‘senso’’). Shortly thereafter, Emperor Yōzei is said to have formally acceded to the throne (‘‘sokui’’). Before Emperor Yōzei ascended to the Chrysanthemum Throne, his personal name (his imina) was Sadakira Shinnō (貞明親王). ↑ McLaren, Walter Wallace. (1916). A Political History of Japan During the Meiji Era - 1867-1912, p. 361. ↑ Williams, David. (1858). The preceptor's assistant, or, Miscellaneous questions in general history, literature, and science, p. 153. ↑ Shûji, Takashina. "An Empress on the Chrysanthemum Throne?" Japan Echo. Vol. 31, No. 6, December 2004. ↑ Green, Shane. "Chrysanthemum Throne a Closely Guarded Secret," Sydney Morning Herald (New South Wales). December 7, 2002. ↑ Spector, Ronald. "The Chrysanthemum Throne," (book review of Hirohito and the Making of Modern Japan by Herbert P. Bix). New York Times. November 19, 2000. ↑ McNeill, David. "The Sadness Behind the Chrysanthemum Throne," The Independent (London). May 22, 2004. ↑ McCurry, Justin. "Baby Boy Ends 40-year Wait for Heir to Chrysanthemum Throne," The Guardian (London). September 6, 2006. ↑ "The Chrysanthemum Throne," Hello Magazine. ↑ McNeill, David. "The Girl who May Sit on Chrysanthemum Throne," The Independent (London). February 23, 2005. ↑ Williams, David. (1858). The preceptor's assistant, or, Miscellaneous questions in general history, literature and science, p. 153. ↑ Titsingh, Isaac. (1834). Annales des empereurs du japon, pp. 19-21; Varley, H. Paul. (1980). Jinnō Shōtōki, pp. 103-110; Aston, William George. (1998). Nihongi, pp. 254-271. ↑ Post, Jerrold et al. (1995). When Illness Strikes the Leader, p. 194. ↑ Martin, Peter. (1997). 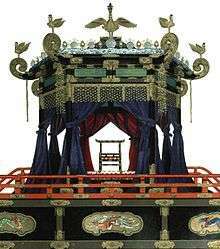 The Chrysanthemum Throne, p. 132. ↑ Titsigh, p. 122; Brown, Delmer M. (1979). Gukanshō, pp. 288; Varley, p. 44; a distinct act of senso is unrecognized prior to Emperor Tenji; and all sovereigns except Jitō, Yōzei, Go-Toba, and Fushimi have senso and sokui in the same year until the reign of Go-Murakami. ↑ Note: The enthronement ceremony (sokui) is something of a misnomer in English since no throne is used, but the throne is used in a larger and more public ceremony that follows later. See Berry, Mary Elizabeth. (1989). Hideyoshi, p. 245 n6. ↑ Brown, p. 264; up until the time of Emperor Jomei, the personal names of the Emperors (their imina) were very long and people did not generally use them. The number of characters in each name diminished after Jomei's reign. ↑ Watts, Jonathan. "The Emperor's new roots: The Japanese Emperor has finally laid to rest rumours that he has Korean blood, by admitting that it is true," The Guardian (London). 28 December 2001.